That is how it looks. However, the way it works is different from a console. You don't get a continuous in/out streams to write to and to read from. Instead, you get a grid of cells which can be addressed independently, a scene. To be precise, a scene is not a single grid, but a number of them, called layers. For a simple game you might not need more than one layer, but sometimes they can be indispensable. Each cell, in turn, can store a number of tiles. Because the library takes full advantage of alpha (transparency) channel of tile images, this effectively allows to combine several images into one, constructing them on the fly instead of preparing tiles for every combination beforehand. Note that each tile in a stack can have its own color. 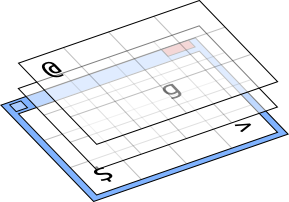 Whats more, each tile in a stack can have its own offset from the default position in a cell. Now, where are those tiles come from? 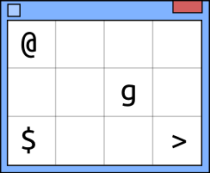 In BearLibTerminal each character code can have a tile associated with it, e. g. a tile for '@' or a tile for '#'. The range of character codes the library operates on is basic multilingual plane of Unicode. This means there are around 65k of slots for tiles. Note that tile size is not restricted by the library. You can have a tile as big as the window, e. g. background image for a menu. By default tile is centered in a cell but it can be easily overriden. The only difference is that you have to specify a size of a single image in the tileset bitmap. The library will slice the bitmap up into pieces and assign them to the character code points. The order BeralibTerminal iterates over them is fixed: row by row, from left to right. By default the tiles are placed into consecutive slots. In the example above there will be four tiles assigned to character points 0x1000 through 0x1003. There is no difference between a tileset and a tile. A single tile is just a small tileset with one image. While the alpha symbol is 0x03B1 in Unicode, it may be placed anywhere in the image. For example, in the Dwarf Fortress font shown above, the beta symbol is in the 15th row, 1st column, which is the 224th image piece. Far from the 0x03B1. And no matter what starting code point you choose, you won't get all of the characters in their proper Unicode slots. This is where a codepage is used. A codepage is a simple mapping from one character code space to another. In this case it is a mapping from indices in the font bitmap to the Unicode code points. By specifying a codepage when loading a tileset you can instruct the library to place tiles not consecutively but according to some list. The codes in a codepage are offsets from the starting code point. In the example above, the library reads a mapping for 224th index (which is 0x03B1 in the codepage 437), adds it to the starting point (the “font” part is just a synonym to zero) and places the tile in the right slot. As you can see now, the main font is just a tileset loaded from starting code point “0”. There is a default built-in bitmap font generated from the Fixedsys Excelsior with a codepage matching the WGL4 list, which is automatically selected upon library initialization. The way TrueType tilesets work is almost the same as bitmap tilesets. You can load several of them to a different starting code points. However, the are some differences. size=12: it specifies an average height of a lowercase letter, in pixels. Be wary that depending to the font face, the actual size of a tile may vary wildly. size=8×16: it specifies a size of a tile directly. The library will try and use the biggest font size fitting this size. will place exactly six ideograms from the FontAwesome font to slots 0xE000 through 0xE005.